It was a straightforward answer that only created more questions. Part way through last week’s Hermosa Beach City Council meeting, during a lengthy discussion of the proposed Greenbelt infiltration project, Mayor Jeff Duclos asked whether planners had ever considered the number of residents living within 500 feet of the potential project sites. Kathleen McGowan, an engineer who has spent several years consulting on water projects in the Beach Cities, broke the string of technical explanations she had provided with her reply. “No, and that obviously was an oversight,” McGowan said. Groans rumbled through the packed council chambers. “You think?” one man shouted sarcastically. 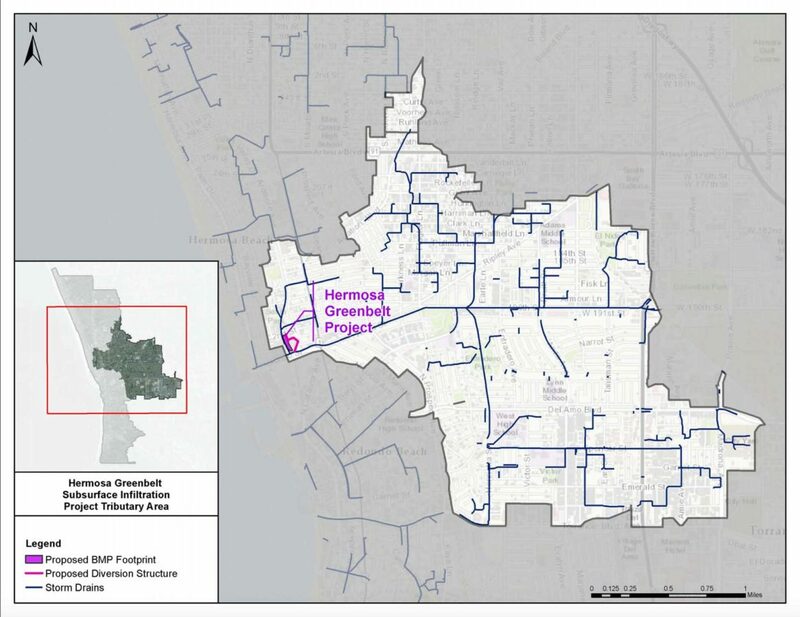 Following a unanimous vote at last week’s council meeting, Hermosa is now attempting to find partners in nearby cities to take on some of the load called for in the Greenbelt project. But as the city searches for alternatives in a race against legal deadlines, questions about why the project was situated there in the first place continue to cloud its future. For the substantial number of residents opposed to putting the stormwater infiltration project on the Greenbelt, McGowan’s response amplified concerns that city staff and project consultants had bungled the process associated with finding a location for the project, which calls for infiltrating as much as 2.4 million gallons of treated water that would otherwise pass through storm drains into the ocean. But although McGowan characterized not considering proximity to residents as an “oversight,” an examination of other planning documents for addressing water quality in the region reveals that it is, in fact, standard practice. The Greenbelt infiltration project would limit the flow of water from the Herondo storm drain, reducing the number of days that beaches near the outfall fail to meet water quality standards. It is the largest, by volume of stormwater captured, among several regional projects contained in the Beach Cities Enhanced Watershed Management Program, or EWMP. Hermosa joined Manhattan Beach, Redondo Beach, Torrance, and the Los Angeles County Flood Control District to form the EWMP in 2013. The Beach Cities EWMP is one of 12 plans submitted to the Los Angeles Regional Water Quality Control Board, each of which identifies projects that will help them comply with mandates stemming from the federal Clean Water Act. Together, the plans cover the principal watersheds of the region, from the Los Angeles River to the Santa Monica Bay. Because of the scale of the area, the programs cover a staggering diversity of population patterns and land types, from dense cities to sprawling suburbs, and coastal wetlands to river valleys. But they have at least one thing in common: none of them consider proximity to residences in the site selection process for regional projects. The regional board does not dictate what criteria the various EWMPs rely on in choosing projects. Instead, it requires only that “cities demonstrate through data and technical analysis that the project design, including the location, will result in the water quality improvements required,” Renee Purdy, an assistant executive officer with the Los Angeles Water Quality Control Board, said in an email. This tracks with what McGowan said at a study session in June on the Greenbelt project, at which she sought to explain why Hermosa, the smallest and densest of the Beach Cities, was hosting a project that would serve so many others. In a difficult-to-follow presentation that left most attendees staring at their phones, McGowan laid out how a combination of GIS mapping of the Beach Cities and a rubric of neutral criteria, such as distance from a major storm drain, had led to the Greenbelt site. McGowan’s presentation revealed that the Greenbelt has much to recommend it, including the porous quality of its soil and its proximity to the outfall. Although it has about half of the storage volume as a trio of stormwater basins in West Torrance, the Greenbelt project would be able to capture more than twice as much stormwater in a year. “It’s instructive and helpful for the council to understand that, at an earlier stage, there was more of an equitable proportioning of the watershed,” McCauley said. Dr. Hubertus Cox works with the City of Los Angeles Watershed Protection Division, where he has helped assemble the four EWMPs on which Los Angeles has served as the lead agency. In an interview, Cox described a site selection process similar to one laid out by McGowan, with a focus on areas where criteria pollutants like stormwater most effectively can be captured. (McGowan previously worked for Geosyntec, an engineering firm identified as a consultant on several EWMPs in the region, including some involving Los Angeles.) In the case of infiltration projects, this meant prioritizing places where the soil is effective at infiltrating the water, and those that sit above an “unconfined aquifer,” meaning sites that can also help recharge groundwater supplies. As was the case in the Beach Cities plan, measurements of proximity to homes, such as the number of residents living within 500 feet, was not a part of the criteria, Cox said. In a county with as many people as Los Angeles, it would be extremely difficult to entirely avoid residents. Water, however, was not the only thing considered. As with Hermosa and the Beach Cities, the methodology Los Angeles relied on prioritized municipally owned sites, to minimize project costs and timetables. The result is that many of the projects are located in parks or open space. For example, in the EWMP for the Dominguez Channel Watershed, all of the priority regional projects are either at parks or the Chester Washington Golf Course, owned by Los Angeles County. And as Greenbelt project opponents have pointed out, few to none of the regional projects elsewhere in the county are as close to homes as the Greenbelt project: some of the Moorings townhomes about the proposed location, and more than 700 residents live within 500 feet of it. At the June study session, John Gardner, a resident of the Moorings, made this complaint and said that the Greenbelt’s cramped surroundings had forced a project design like something out of Rube Goldberg. Although it is not standard practice to consider the proximity of residences in locating potential EWMP projects, cities are expected to reach out to the public. And while the critical early decisions about the EWMP were made in noticed public meetings, the proposed project locations were contained within dense documents — the Beach Cities program runs to hundreds of pages and contains more than 100 technical abbreviations — that did not make it easy for residents to realize what was happening. City Manager Suja Lowenthal admitted last week that the city’s outreach to residents has been lacking. Some of the difficulty, however, also stems from different ideas about what exactly an EWMP is supposed to do. “The EWMP is not the endpoint. There is a whole lot of additional work still to be done. The EWMPs are planning documents. They’re at 10,000 feet. In order for you or anyone to decide to move forward with a project, you have to go down to ground level: verify local constraints and opportunities, get to the neighborhood level, before you have a final project,” Cox, of the City of Los Angeles, said. In the case of the Greenbelt, the regional board felt the project is needed to meet water quality goals, and hoped that “the community recognizes the significant long-term water quality improvements that the project will achieve at the local beach,” Purdy said. Many of the concerns that have emerged since the Greenbelt site became more widely known, such as noise and traffic associated with a potentially lengthy construction period, will be addressed later. “As cities begin to implement specific projects from their enhanced watershed management program plans, there are additional steps such as environmental review required by the California Environmental Quality Act, which also includes community outreach and input,” Purdy said. Hermosa council members have said that in the event an ensuing environmental review process were to reveal a significant project defect, the city would not move forward. But objecting residents fear by the time the environmental review process rolls around, enough time and money will have been invested into the Greenbelt site that momentum may push the city in a direction it shouldn’t go. McCauley contrasted the situation to that of the Strand and Pier hotel project where the developer, long before the release of the project’s draft environmental impact report, tweaked the design to meet resident concerns. Addressing the location when it was identified in 2015, McCauley said, would have helped matters greatly, especially considering the looming deadlines Hermosa and other Beach Cities now face. “We’d certainly be in a much better position with three additional years to address the public’s concern and work with the City of Redondo,” she said.